Financing is now available through PayPal Credit or Snap Finance! Learn more about PayPal Credit here. 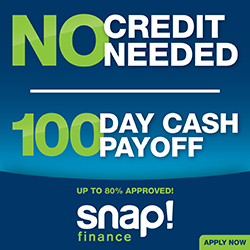 Click on the Snap Finance banner to learn more and apply. Please note that some items, such as Open Box, Demo, and Closeout items are ineligible for financing.